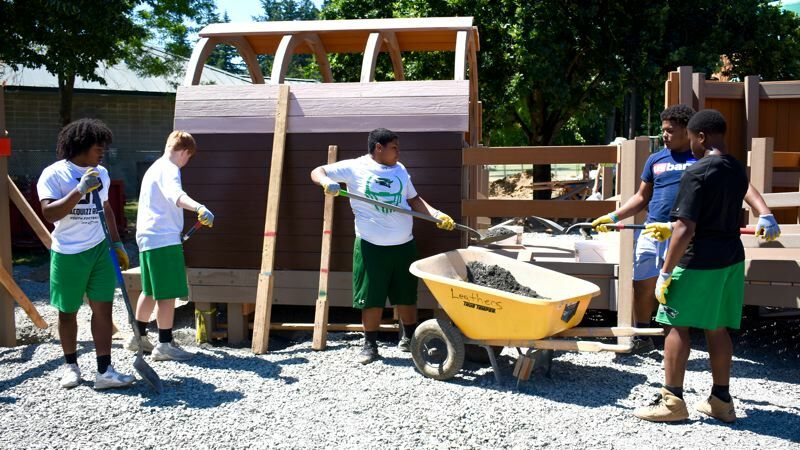 After months of construction and volunteer-labor weekends throughout the summer and early fall, the rebuild of Imagination Station — Troutdale's signature playground west of Reynolds High School — is nearing reality. 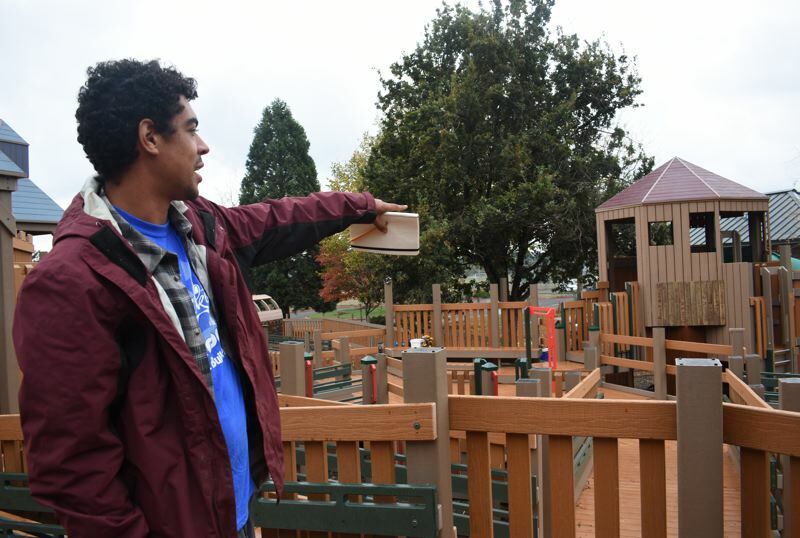 As long as it doesn't rain heavily during the week, one more volunteer day, scheduled for Saturday, Oct. 13, will be needed to finish Imagination Station II, said Taj Leathers of Leathers & Associates computer-aided design specialist and playground consultant. "We're kind of shooting for Saturday to get all the equipment in, and by then the ground (should be) ready to go," Leathers said. "Then we have to wait for good enough weather for the rubber company to come in, which is why we're trying to get everything ready ASAP. So as soon as there are couple of days that are good enough, we are going to get them in here and get the rubber down." Leathers noted that once the park is finished, it will take a little time for the surface to dry before the playground can reopen. L&A was hired by Troutdale for the design and construction of the park at 1900 S.W. Cherry Park Road, and the contractor incorporates volunteer help in the construction of their parks to lower their projects' price tags. 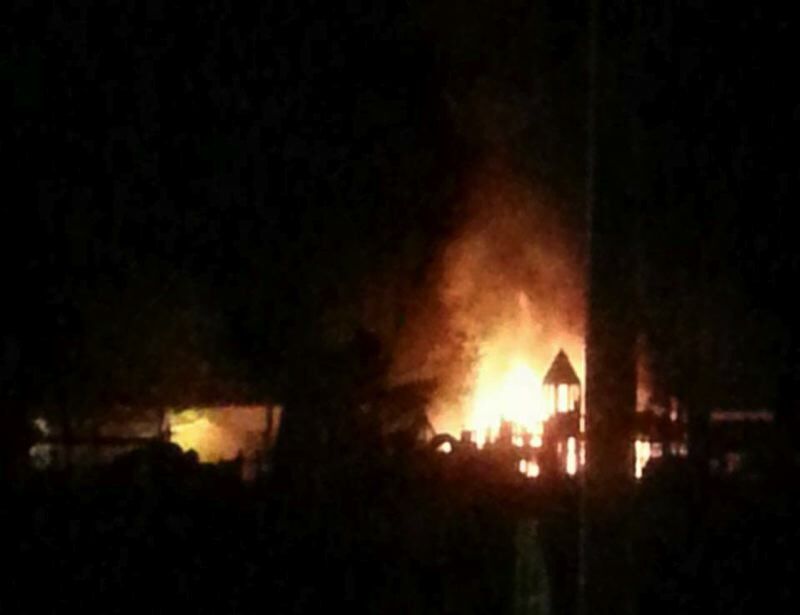 One third of Imagination Station was destroyed by fire on April 9, 2016. Video surveillance shows images of two suspects setting the structure ablaze. In the two years since the apparent arson, the suspects recorded in the video have not been identified and no arrests were made, said Sgt. Brandon White, Multnomah County Sheriff's Office public information officer. 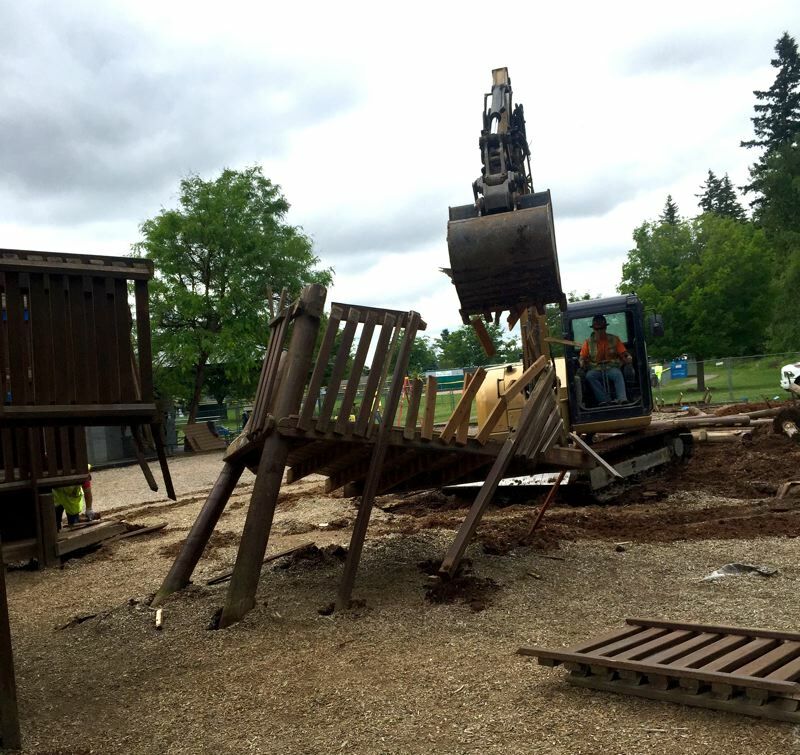 To make way for the new play structures, construction crews and volunteers razed the original Imagination Station structures on Saturday, June 16. The effort was so successful that a second scheduled volunteer deconstruction weekend was canceled. Since the quick disassembly, Imagination Station Volunteer Coordinator Kimberly Carl organized volunteer rebuild weekends throughout this past summer to encourage community members to pitch in. An Imagination Station reopening was scheduled for late summer, but construction was delayed because — ironically, perhaps — two fires broke out at separate East Coast manufacturing plants producing parts for the playground. Carl said while those fires were unfortunate, she doesn't believe the playground is cursed, and construction efforts got back on track Oct. 1. The rebuilt park will be enjoyed by children of every ability level because it is an all-inclusive design, Leathers noted. For example, monkey bars will be installed at the standard height for a playground, with another set constructed at a lower height. "So if you're in a wheelchair you can use them, and lot of people in wheelchairs have better upper-body strength," Leathers said. Also to accommodate wheelchairs, a wide path was built throughout the main playground. Entrances throughout the park allow for wheelchair users to move from their chair onto another structure. At the top of the main structure, a bar next to a slide functions as one of these points. "So a kid in a wheelchair can come up, park their wheelchair, and have their caretaker take it around (to the bottom of the slide)," Leathers explained. "The kid can actually work themselves up, and go down the slide." Also at the top of the main structure, a small section rocks back and forth that a child can walk on, and a chair can also fit on. "For kids in wheelchairs, it's a whole new movement for them," Leathers said. In addition to incorporating handicap accessibility into the design, other areas will include two types of equipment side by side (such as the monkey bars) allowing children to play together regardless of individual mobility limits. "They can be right beside their buddies, and kind of feel in the mix," Leathers said. All-inclusive play structures are a common feature of Leathers & Associates parks, but what's unique to the Troutdale playground is its Oregon-themed aspects. Those motifs include a barn with paintings of Oregon birds and a covered-wagon play structure. "We tried to bring out all the cool elements of Oregon," Leathers said. There's been long history of community involvement with the park's construction. The original adventure playground was built in 1994 with the help of thousands of volunteers. In 2012, a grant from Metro regional government was awarded to Troutdale to expand the park, and volunteers helped touch up the park then too. This time around, not as many volunteers have showed up, but a few community members are dedicated to completing the park. 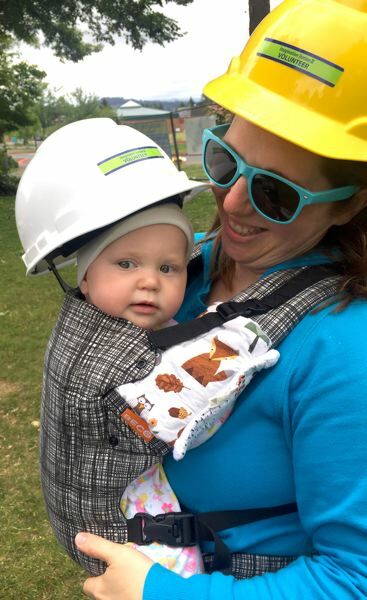 Tiffany Kallgren has helped out at every volunteer weekend, enlisting the help of family members, including son Alexander Kallgren, 6, the youngest volunteer to actively assist with construction. 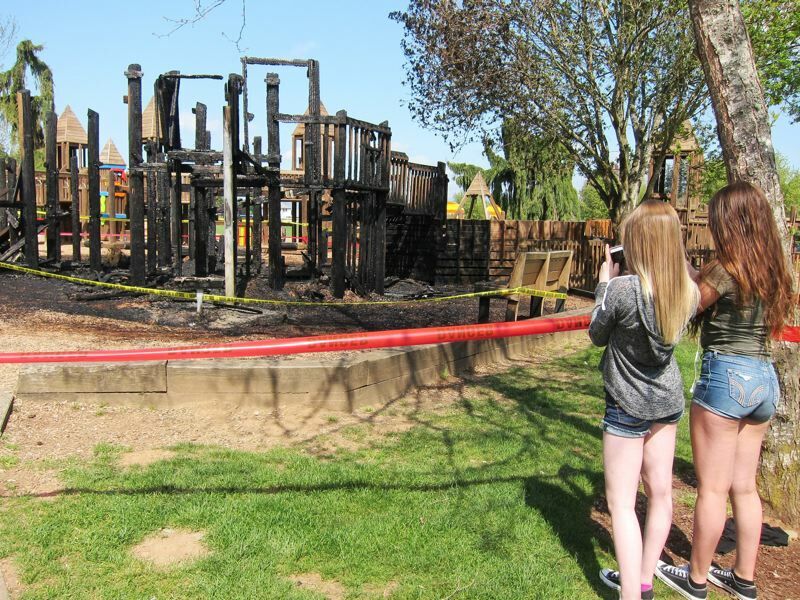 "This was my kids' favorite park, and they were devastated when it burned," Kallgren said. 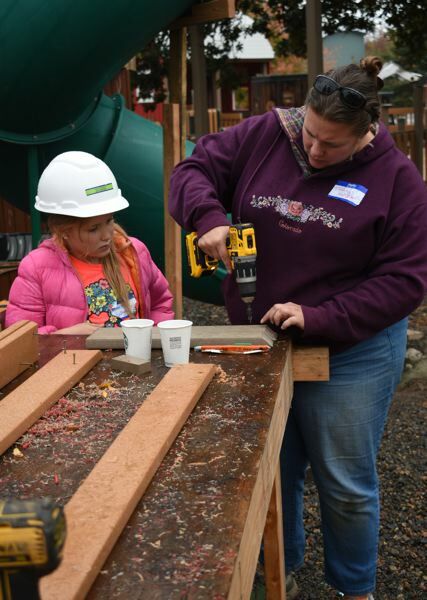 During the latest volunteer weekend on Saturday and Sunday, Kallgren and her 8-year-old daughter Victoria were drilling holes in board posts and erecting them throughout the park. The Kallgrens also will be at the park Saturday, Oct. 13 to help finish construction, and if any other volunteer days are needed, she and her available family members will be back to lend their hands. Victoria said she is excited for the final Imagination Station playground. "It's really cool," she said.